The University of Maine’s women’s basketball team was on the brink of a hard-fought win over Fordham University in the Fordham Holiday Classic in the Bronx, N.Y. on Saturday afternoon. UMaine held a two-point lead and had the ball with 11.8 seconds left, but a player-control foul against Tanesha Sutton gave the ball to Fordham. Kaitlyn Downey rebounded Bre Cavanaugh’s 3-point miss and scored a reverse layup with 2.1 seconds left to tie it in regulation and the Rams outscored a depleted UMaine lineup 11-3 in overtime to collect a 72-64 victory. Fordham (8-5) notched its third straight win while the 7-5 Black Bears absorbed their third straight loss. It is the first time UMaine has lost three in a row since it had a four-game losing streak from Dec. 20, 2016 to Jan. 4, 2017. UMaine takes on 4-10 Chattanooga, a 58-47 loser to Middle Tennessee State, in Sunday’s 1 p.m. consolation game while Fordham faces 8-3 Middle Tennessee State at 3 p.m. 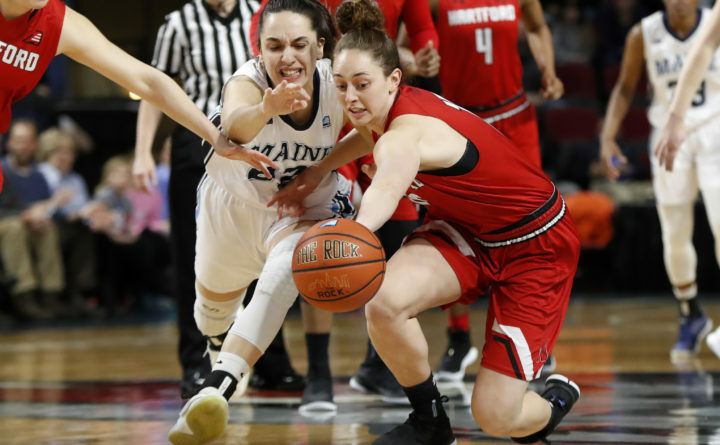 In the overtime, UMaine was without three players who started the game as fifth-year senior guard Parise Rossignol sustained a back injury early in the third quarter and leading scorers Blanca Millan and Sutton both fouled out. Junior forward Fanny Wadling also missed her ninth consecutive game with post- concussion issues. Fordham took full advantage as Cavanaugh’s jumper and 3-pointer gave the Rams a 66-61 lead, then Megan Jonassen scored five unanswered points to sew up the win. Cavanaugh finished with a game-high 27 points and added eight rebounds and three assists. Lauren Holden provided 11 points and six assists and Kendell Heremaia had 10 points and nine rebounds. Jonassen chipped in eight points and six rebounds and Mary Goulding contributed seven points and five rebounds. Millan’s 16 points and five rebounds, Dor Saar’s 15 points and Sutton’s 12 points, nine rebounds and three assists paced UMaine. Saar’s two free throws with 41.9 seconds left in regulation had supplied UMaine with a 60-59 lead in the seesaw affair. Sutton then rebounded a Fordham miss and was fouled with 19.5 seconds remaining. She made one of two free throws to make it a two-point lead before a traveling call gave the ball to back to the Black Bears. The call on Sutton returned the ball to Fordham. Downey’s offensive rebound that set up her game-tying basket was one of 19 offensive rebounds for the Rams. “We gave up too many offensive rebounds,” UMaine head coach Amy Vachon told Don Shields of the Black Bear Sports Network. She said she was less than enamored with some of the officials’ calls during the game but was proud of the players and the way they fought. The Black Bears jumped out to a 15-4 lead and led 19-11 after the first quarter before the Rams went on an 8-2 run in the second period that to pull within two. The cold-shooting Black Bears scored only six points in the second period and Fordham took a 28-25 lead into the intermission. Rossignol fell hard early in the third quarter and didn’t return and Fordham used a 9-3 run to build a six-point lead. Kelly Fogarty’s 3-pointer and two Saar baskets helped UMaine cut the deficit to one late in the third period and two Sutton free throws to close out the quarter shaved the margin to one entering a back-and-forth fourth quarter.